Comic Book / Captain Carrot and His Amazing Zoo Crew! 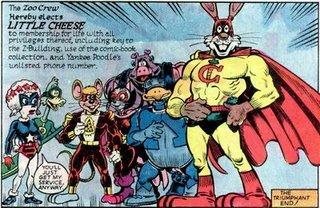 Left to right: Yankee Poodle, Rubberduck, Little Cheese, Alley-Kat-Abra, Pig Iron, Fastback, and Captain Carrot. Captain Carrot and His Amazing Zoo Crew! is a team of Superhero Funny Animal characters owned by DC Comics. They were first published in their own comic book series in the early 1980's, though it didn't last very long. Created by writer Roy Thomas and artist Scott Shaw, this was the first team of Funny Animal characters to be specifically recognized as being part of the DC Universe. Fastback, actually a Country Turtle named Timmy Joe Terrapin who had gained superspeed. Rubberduck, actually movie actor Byrd Rentals, who became elastic. Yankee Poodle, secretly gossip columnist Rova Barkitt, who gained the ability to shoot "stars" that repelled objects out of one hand and "stripes" that attracted them out of the other. Martial artist Felina Furr gained magic-like powers and renamed herself Alley-Kat-Abra. Peter Porkchops, a pre-existing DC funny animal character, was transformed into a large, living metal being with Super Strength and Nigh-Invulnerability, and thus renamed himself Pig Iron. Later, the team was joined by Little Cheese, actually a mouse named Chester Cheese, who had the power to shrink down to the size of... well, a mouse. A smaller mouse. As you can see, despite supposedly being as "real" as the rest of the DC universe, Earth-C (and the series) was full of the kind of puns you see in cartoons. This is never explained beyond a "what seems funny to us make sense to them" attitude. (Lampshaded when Changeling of the Teen Titans visits Earth-C and asks the Crew about why their cities have such "silly names") note It turns out they think our city names sound equally silly. "I'll bet in Washington they've always got a ton of washing to do!"). The Zoo Crew battled both their own villains and ones from the main DC Universe (Starro, the Starfish Conqueror, an old Justice League alien enemy, in their first issue; Gorilla Grodd in their last.) They also met the "Just'a Lotta Animals" ("JLA") a team of heroes from the similar "Earth C-minus" whose heroes were Expies of DC's main heroes. After the series was canceled, the characters reappeared in, of all places, "The Oz / Wonderland War" miniseries, which was Exactly What It Says on the Tin. Decades later in the 2000s, they reappeared in an issue of Teen Titans (as part of a comic book one of the characters was reading) in a story that parodied the "Dark Age" style of modern comics: The team had disbanded after Little Cheese's death, whose murderer (seemingly) turned out to be Alley-Kat-Abra! This was followed by a 2007 miniseries, Captain Carrot and the Final Ark, where the team was reunited and Abra was cleared of the murder (it was her Evil Twin). They were joined by a new member, the non-powered crimefighter American Eagle, secretly right-wing talk show host Johnny Jingo. However, Earth-C was flooded as a result of a war between aquatic and non-aquatic animals, and the heroes had to evacuate it on a "Space Ark." They ended up on the main Earth of The Multiverse, but found themselves changed into normal animals while there. However, they were changed back to their true forms in the last issue of the Final Crisis Crisis Crossover. Captain Carrot has now reappeared in the pages of The Multiversity, while both he and Fastback are significant characters in several tie-ins of Convergence. Not to be confused with that other Captain Carrot. Animal Jingoism: Subverted, it doesn't really happen here except for Abra's murder of Little Cheese (which turned out to be the work of a magically created Evil Twin/Doppelgänger). Badass Normal: American Eagle, sort of; he didn't have any super powers, and only the abilities associated with being an anthropomorphic eagle. Barefoot Cartoon Animal: A few of the characters. In an odd subversion, a good portion of the characters wear completely formfitting boots, complete with individual toes. Big Applesauce: Rodney hails from "Gnu York" (Earth-C's New York City). The Big Easy: Alley-Kat-Abra hails from "Mew Orleans", Earth-C's version of New Orleans. Bizarrchitecture: The Crew's home base, the "Z-Building", which is shaped like the letter "Z". This is an Affectionate Parody of the Teen Titans' H.Q., as their series was at the height of its popularity at the time. Brick Joke: The end of Final Ark, which deliberately tossed the brick for Grant Morrison to drop in Final Crisis. Canon Immigrant: The Fox and the Crow, which not only had its own theatrical cartoon series but ran as a DC comic for twenty years, is considered an official part of Earth-C.
Earth-C's animals long ago stopped being carnivores. Peter Porkchops used to be a regular funny animal which was reused in this series, and in the early Peter Porkchops strips, his wolf neighbour actually wanted to eat him. This is referenced in the comic with Wolfie seeking psychiatric treatment, because he is having cannibal fantasies and it worries him. It ends badly despite his good intentions—see Our Werewolves Are Different below. Combat Stilettos: Alley-Kat-Abra wears them. Continuity Nod: Several characters from DC's old Funny Animal comics make appearances, often turned into the Monster of the Week. Cunning Like a Fox: One of the more popular secondary characters who showed up quite a few times was a blond vixen named Farah Foxette. Darker and Edgier: The revival Comic Within A Comic from Teen Titans #30 & #31. The team split apart, Fantastic Speciesism running rampant, team members dead or missing, the Super Registration Act, Rodney Rabbit in the middle of a Heroic BSoD (and a bottle)... and, of course, Alley-Kat-Abra (seemingly) turning evil. The New 52 comic Threshold features "Captain K'Rot", described by writer Keith Giffen as "a borderline psychotic, booze-swilling, whore-mongering rabbit." Deep South: Fastback hails from a swamp in the rural American South, and has a hayseed personality. Distaff Counterpart: Carrie Carrot, for Captain Carrot. She was introduced as a Posthumous Character in the 2000's Teen Titans story — her death mainly served to justify Rodney's Heroic BSOD, as well as someone whose name American Eagle could invoke to get Captain Carrot back in the game. Downer Ending: See next entry. Dropped A Bridge On Them: The Zoo Crew's fate at the end of The Final Ark seemed needlessly cruel and left a bad taste in a lot of long-time fans' mouths. Thankfully, this may have been a Brick Joke, resolved in Final Crisis; fan speculation has it that Grant Morrison used Final Crisis to undo what he saw as obnoxious Executive Meddling. Morrison later used Captain Carrot as a character in The Multiversity, where he knocked out a Captain Ersatz of The Incredible Hulk—with one punch. Fantastic Racism: Introduced in the Teen Titans revival. A major plot element of The Final Ark was a species war brewing between land and water animals — ducks and turtles were distrusted as Category Traitors. Flintstone Theming: Every possible pun you can think of that could be made involving animals was made in this series. The names of the cities were just the start. Franchise Zombie: An In-Universe example in a Conan the Barbarian parody story; Ezra Hound's "Bow-Zar the Barkbarian" series reached this point, and he's ready to finally end it. But he hires Pig-Iron as a bodyguard because of the nightmares he's been having of his anti-hero seeking vengeance. Meanwhile In The Past, a real Bow-Zar's visions of a magician (Hound) drive him to travel into future Follywood seeking vengeance. Full-Frontal Assault: Effectively the result when Gorilla Grodd comes to Earth-C without putting on any pants. Hollywood, California: the team's headquarters is in "Follywood, Califurnia", with two of its members being southern Califurnia natives (Rubberduck and Yankee Poodle). Intercontinuity Crossover: The Oz/Wonderland War. The second issue of that miniseries upped the ante when the Nome King accidentally summoned Wonder Wabbit, Hoppy the Marvel Bunny and his girlfriend Millie, the March Hare, the Easter Bunny, Wonderland's White Rabbit, and Bo Bunny from one of DC's old Funny Animal comics, along with Captain Carrot. The plan was to trap them with a Quirky Miniboss Squad of Fantastic Four parodies, but it goes so wrong the Nome King has to literally wish he never thought of the plan to keep them from ending the miniseries early. It's Always Mardi Gras in New Orleans: In the team's origin story, several future Zoo Crew members visit "Mew Orleans" (Earth-C's New Orleans) during its Mardi Gras celebration. This is when Alley-Kat-Abra, who lives in Mew Orleans, joins the group. Last of His Kind: American Eagle; Alley-Kat-Abra's Evil Twin funded the species-ist group that killed his parents. Lawyer-Friendly Cameo: "Oklahoma Bones", among others. Magic Meteor: How most of the Zoo Crew got their powers. Magic Wand: Alley-Kat-Abra's "Magic Wanda". Millard Fillmore: Parodied as Mallard Fillmore (No relation). Mixed Animal Species Team: The original members were a rabbit, a turtle, a duck, a dog, a cat, and a pig. The two Sixth Rangers are a mouse and an eagle. Naked People Are Funny: When Grodd the Super-Gorilla travels to Earth-C, his biggest immediate problem is everyone's reaction to his being naked. Nigh Invulnerable: Captain Carrot is shown to have nowhere near Superman's level of invulnerability, but he's still plenty tough. Pig-Iron may be even more durable, though he's vulnerable to things that damage metal. No Celebrities Were Harmed: Farrah Foxette, Byrd Rentals, and bucketloads more. Now Do It Again Backwards: Literally flying a spaceship backwards in one story—to escape an Unrealistic Black Hole. "It'll never notice the difference!" Our Werewolves Are Different: One story had a "wuz-wolf"—a mild-mannered wolf who turned into a monstrous, cannibalistic human at night. Patriotic Fervor: Averted with Yankee Poodle; the power effects dictated the gimmick. Played straight with American Eagle. Pittsburgh: Pig-Iron hails from its Earth-C counterpart, "Piggsburgh." Power-Up Food: The cosmic carrots that transform Rodney Rabbit into Captain Carrot. Punny Name: The comic is full of them. Put on a Bus to Hell: The Zoo Crew itself at the end of "Final Ark", though that seems to have been fixed. Raiders of the Lost Parody: The Crew meet a Funny Animal version of Indiana Jones called Oklahoma Bones. Recursive Canon: Earth-C is an alternate Earth-Prime. Earth-C-Minus is an alternate DC Universe. Rodney Rabbit draws Justa Lotta Animals, who are real superheroes on Earth-C-Minus who end up suing Wombat Communications (a take off on Warner Communications, DC's then-parent company) for trademark violation. Righteous Rabbit: Captain Carrot, of course. Roger Rabbit Effect: The second type. The uniform of Stargirl of the Justice Society of America was partly inspired by Yankee Poodle. Yankee Poodle is Stargirl's favorite character, which explains the costume. Sitcom Arch-Nemesis: Yankee Poodle and Alley-Kat-Abra occasionally engage in spats. Alley-Kat-Abra also tended to be this in the original series with anyone who is a possible love interest for Captain Carrot, due to Unresolved Sexual Tension. Sixth Ranger: Little Cheese and American Eagle. Starfish Alien: Literally, with old JLA foe Starro the Conqueror. Wolverine Publicity: Superman in the origin story. Also, Changeling from the then astronomically popular Teen Titans in the last issue (lampshaded: "Alright, already! We admit it! We sold out! ").